Our themed days are going well. After Space Day and Dinosaur Day it was time for Antarctic Day. I'm not entirely sure how we came up with the theme Antarctic Day, it was certainly a little more challenging for me to prepare! 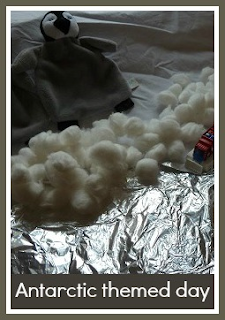 I began by decorating the kitchen table with a white sheet, some tin foil for a lake and a few stuffed penguins, with cotton wool balls heaped all around. The biggest problem that I had when looking for resources was the confusion between Antarctica and the Artic. Just for the record, polar bears live in the Artic and penguins live in the Antarctic, they only meet in zoos. I finally did manage to track down some purely Antarctic colouring pages which are very good, and formed the basis of our Antarctic poster. For our Antarctic poster we just used a large sheet of white paper, then decorated it with the coloured Antarctic animals, some tin foil for icy lakes and lots of cotton wool balls. I also found a printable map of Antarctica. There wasn't anything to colour in, but Harry enjoyed cutting it out. It is a bit difficult for little ones to grasp the shape of Antarctica, because normally when you see Antarctica on a map it is in a straight line across the bottom. I used an iPad atlas app that we have to show how Antarctica appears when you look at Earth as a globe (obviously a traditional globe would also work, but we don't have one!). We also did a map jigsaw that we have which shows animals of the world, and talked about where Antarctica is in relation to the other countries. After asking Twitter for help in coming up with some Antarctic themed treats to bake, Caroline suggested snowball cakes with coconut, and that reminded me that I've been wanting to try some cake pops. So I decided snowball cake pops were the way to go. They weren't quite as successful as I'd been hoping so most of them ended up as snowball cake balls. You can read about how I made them here! I found a few extra resources that were more wintery than specifically Antarctica themed, but they still worked well. I downloaded a winter counting sheet (free download), design your own winter clothes (free download) and winter pencil control worksheets (Twinkl subscriber resource) from the Twinkl website. Harry is really interested in cutting out at the moment, so he enjoyed cutting out the pictures once he'd finished the worksheets. Another activity that I didn't get to was making paper snowflakes by cutting up folded paper. Another successful themed day! I'm hoping to try another next week although we have a bit more on so it might be spread over several days. We're having a lot of fun! Thank you, yes you must! I love your theme days. Giving me lots of inspiration for the future. The snowball cakes look lovely, and I'm glad my idea was helpful! Thank you, it was a great idea! It drives me up the wall when pictures of polar bears and penguins appear together (and lions and tigers). I'm loving your theme days! It was really irritating me when I was looking for Antarctic colouring pages and I kept getting polar bears and reindeer!